Available in two sizes (Medium and Large), the Outwell Albatross range of cooler bags offers a versatile facility for keeping food fresh and drinks cool on site or on days out. A well-insulated outer with high insulation valve from its lining of 10mm foam contains a solid, removable interior box that allows easy cleaning. The Zipper-free lid is virtually airtight and thus cutting air circulation for better insulation. Easy to carry, the adjustable strap has a padded sleeve for comfort and an outer pocket is useful for picnic items. Tested to BS EN 12546-2:2000, it can be used with ice as well as freezer blocks. The Outwell Albatross combines the sturdiness of a cool box with the flexibility of a cool bag. The removable, anti-bacterial, inside box allows for easy cleaning, and its zipper free lid limits air circulation for better insulation. This means food stays fresher longer. 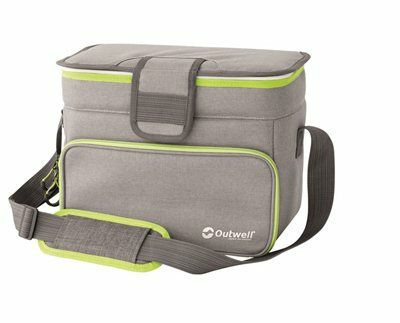 Removable solid plastic inner for easy cleaning , Zip-free lid, Snug fitting lid enhances insulation, Can be used with ice, External front zip pocket, 10mm foam, Insulation tested to BS EN12546-2:2000 – Stays cool for 8 hours using a 800ml Outwell Ice Block, Adjustable padded shoulder strap, Inner Divider.